Penalties of up to 20 million Euros or 4% of your annual global turnover whichever is higher, can be issued if you are in breach of the new GDPR laws. If you are a company, organisation or individual that holds, uses or processes confidential or personal data, there is a statutory requirement for the disposal of such data – usually in paper form – to be performed in a professional, diligent and environmentally friendly fashion. For confidential documents, security shredding is recognised as the best way of discharging all your legal obligations pertaining to data disposal and of discharging your environmental obligations. In partnership with one of Scotland’s largest data destruction companies we offer a professional collection and offsite shredding solution, in their secure CCTV monitored destruction centre with no messy, noisy or polluting onsite shredding trucks calling outside your premises, all to EN15713 standards. Audit - It starts with a complete audit of your premises. The visit and audit helps to identify your shredding requirements. Design – Once the analysis has been completed, we will design a suitable plan for you outlining the appropriate number and styles of shredding units or bags required for your premises as well as the recommended collection times/cycles. Collections – After the plan has been approved we will provide any equipment required i.e. Security Bags, Lockable Cabinets or Bins to contain your confidential waste until it is ready for collection. Destruction – The collected confidential waste is returned to our partner’s premises where it is shredded to EN15713 standards and the shredded material is baled and sent to the nominated paper mill for recycling into new paper product. Verification – After each collection, you will be provided with a destruction certificate to verify that your documents have been securely destroyed. Account Management – We will proactively review your needs, making recommendations with appropriate up and downsizing of units to ensure you receive the best possible care. Invoicing – We will then invoice you for the service that is delivered by our partner. To implement a secure and cost effective shredding solution in your business, please contact your account manager or speak to one of our team. Looking for a stamp? We offer a wide range of stamps to suit the needs of both businesses and individuals. Our products can be customised easily with your own text or logo. Many other types of custom stamps are available, such as date stamps, numbering stamps and business card stamps. We also provide replacement ink pads to further extend the life of your stamp. 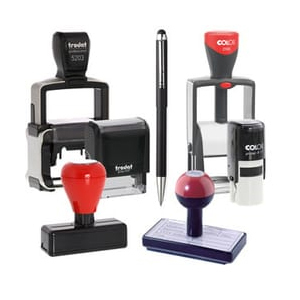 Many of them are easy to use self-inking rubber stamps, however, we also supply a range of pre-inked stamps, stamp accessories, embossing seals as well as signs and badges. We only supply the highest quality stampers, ink pads and inks, manufactured in compliance with environmental standards using a high percentage of recycled plastics.